The world’s Top 50 best-selling tours of the first half of 2018 generated a record $2.21 billion — up 12% year-on-year by $240 million. 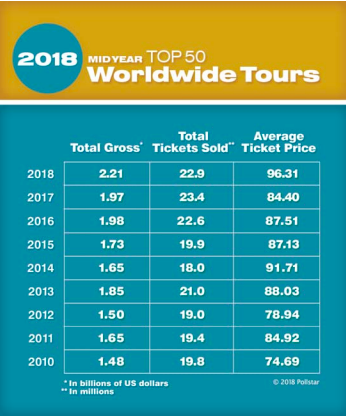 However, alongside the rise in revenues, the average ticket price also hit an all-time high of $96.31 according to Pollstar’s mid-year statistics. That price is up over 14% on 2017’s mid-year ticket price average of $84.40. At the mid-year point last year, 500,000 more tickets had been sold amongst the top 50 tours, but typically for a cheaper price. In the first six months of this year, 22.9m tickets were sold across the Top 50 tours — in 2017 that figure was 2% higher at 23.4m. The rise in ticket price and resulting gross revenue increase is said to be down to the live entertainment industry’s “aggressive pricing strategy to better meet demand and exclude the secondary market”. Ed Sheeran claimed the best-selling tour, grossing $213.9m with over 2.6m tickets sold for an average price of $80.90 across 52 shows. Bruno Mars’ tour was in second place with $113.4m from over 857k tickets for an average $132 price, followed by The Rolling Stones with $100.8m and 633k tickets at an average $159.